1. Build a Bear – This is probably my favorite thing that we did for our son when his sister was born! A few weeks before my due date, we went to build-a-bear and made him a little animal. While there, I was able to pre-record my voice in the bear telling my son “I love you”. We put the bear away until his sister was born, and then we gave it to him at the hospital. My MIL says that he pushed the button for about an hour straight when they left the hospital, and it really seemed to help comfort him since he couldn’t be with mommy. A simple present, but one that he still sleeps with to this day! And it only cost $18! If you don’t have time to make a recorded bear, there are also affordable big brother bears and big sister bears on amazon! 2. 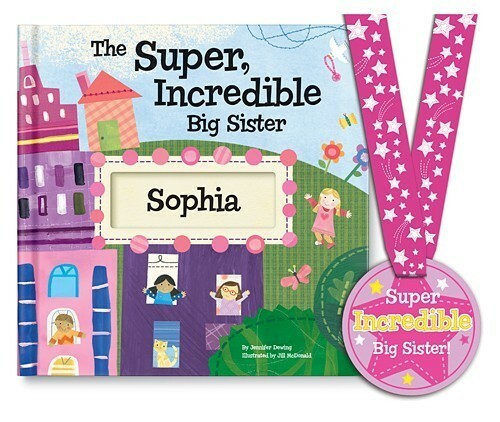 Big brother or big sister books – There are a lot of great books out there about the transition to “big brother” or “big sister”! Some of my favorites were Hello Baby! by Lizzy Rockwell (read my review of this book here) and I’m a Big Brother book or I’m a Big Sister book by Joanna Cole. My son loved these books, and they really seemed to help him grasp what was going on in his family! 3. 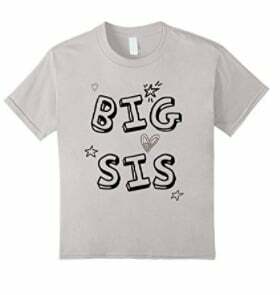 Big Sister Scrubs or Big brother scrubs – These are absolutely adorable! We didn’t do this for our son, but I kind of wish that we had! This is a great idea for any age child, and kids get really excited about having a new outfit to wear for the baby, and dressing up like the Dr.
4. Baby Doll – This can be a really useful gift idea, especially for boys! Giving the child a new baby doll to care for, can help them adjust to the new baby in the home. It is a great tool for when mommy is caring for the new baby and big brother or big sister is wanting attention! Mommy can offer that they go get their new doll and care for the doll in the same way that mommy is caring for baby. Feed the baby and doll together or even have them share a bath time! Activities like this that involve the new big sibling in caring for the baby, can really help make the transition easier for the older child! Buying a doll before the new baby is born can also help with teaching a younger child how to interact with a new baby, practicing words like “soft” and “gentle”. 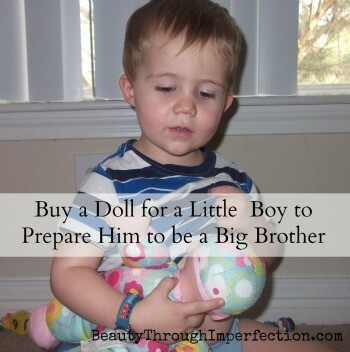 You can read about our experience giving Little Man a doll before his baby sister was born. 5. Scrapbook – This is especially great for older children! Create a scrapbook of their birthday, and life. Add in a few pages that talk about the transition when the new baby comes. These pages could include photos of whomever will be staying with the child while mama is in the hospital, and pictures of the baby’s nursery. Then, make a couple blank pages, and explain to the child that those pages will be filled in with photos when the new baby arrives! Take special pictures of the new big brother or new big sister with the baby and make a big deal about completing the scrapbook after the pictures are printed. This can also be a perfect opportunity to spend a little bit of one-on-one time with the older child after the baby is born! You could even buy a kids camera for the older child and have him or her be the “official photographer” after baby is born. It will help the toddler feel important and involved in all the happenings with baby! 6. Coloring shirt – I know I said 5 gift ideas, but since I wrote this post a few years ago, I had to update it when I created these super-fun coloring shirts! 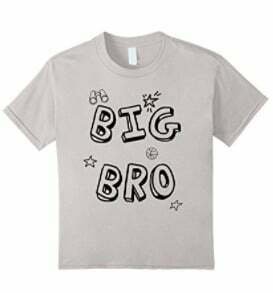 There’s one coloring shirt for big bro and one coloring shirt for big sis. They can color the shirts with washable markers to design them again and again OR use permanent markers to keep their original design forever! Kids LOVE decorating their own shirts and these are too cute!!! bonus! 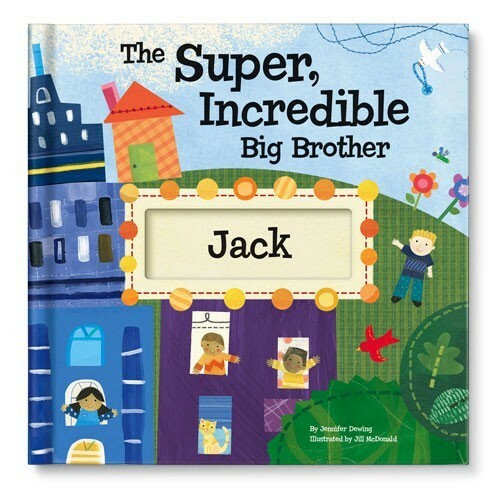 – Create a customized book for the new big brother and big sister. After baby comes, be sure to make baby one of these ADORABLE BABY BOOKS. 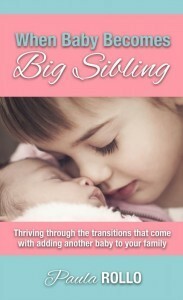 BONUS GIFT: Download this free interview to do with the new big sibling. There’s one for new big brothers and one for new big sisters. It’s a fun activity and turns into an adorable keepsake. Visit these posts for more tips about preparing your toddler to become a big sibling and Tips for helping your toddler adjust to the new baby! 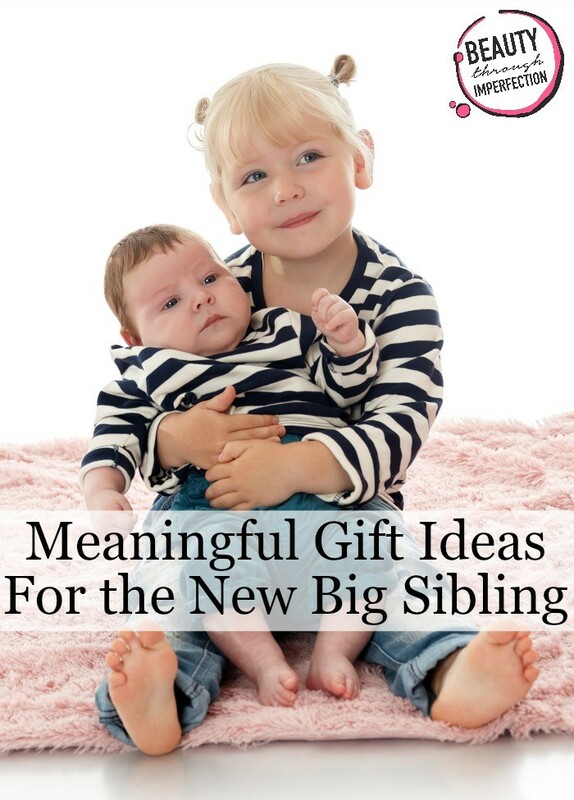 Are you planning on giving big brother or big sister gifts to the older siblings when baby is born? What gift(s) will you give them? Great ideas! Wouldn’t you know I clicked your link from about 100 at the Time to Sparkle party. Somehow I always manage to get here & love what you’ve got to share. Thanks, Paula! HI Paula! I am coming from Titus 2sday. I am so happy about this blog post today! My daughter is having #2 baby in December. Her little girl is going to be surprised by the new changes, I am sure. It’s great to have some ideas to make her feel special. Great idea! I really love the Build-a-bear, so sweet! What great ideas! I didn’t do any of them except the big brother / big sister books with my kids! I wish I had thought of these! Thanks for linking up with us at LOBS! What a wonderful post with great ideas! 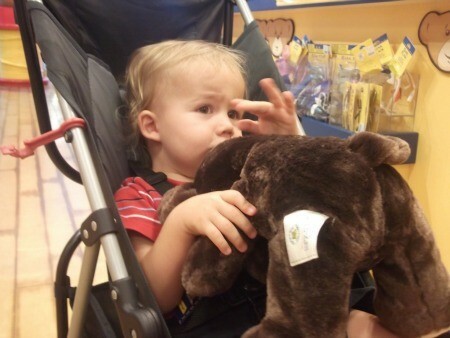 I love the “build a bear” gift and especially how your little one reacted to it at the hospital! These ideas are great. If you are ever looking for a way to involve the big brother/sister BEFORE the baby arrives, may I also suggest “Making Me: The Pregnancy Activity Book for My Big Brother or Sister” by Julie B. Carr. It is designed for the older sibling (4-10 yrs old) and helps them understand the baby’s development day by day. Recommended by Child Psychologist and Pediatrician to help create an early bond between the sibling and the new baby-to-be. Congratulations to all the new mommas and older siblings out there! 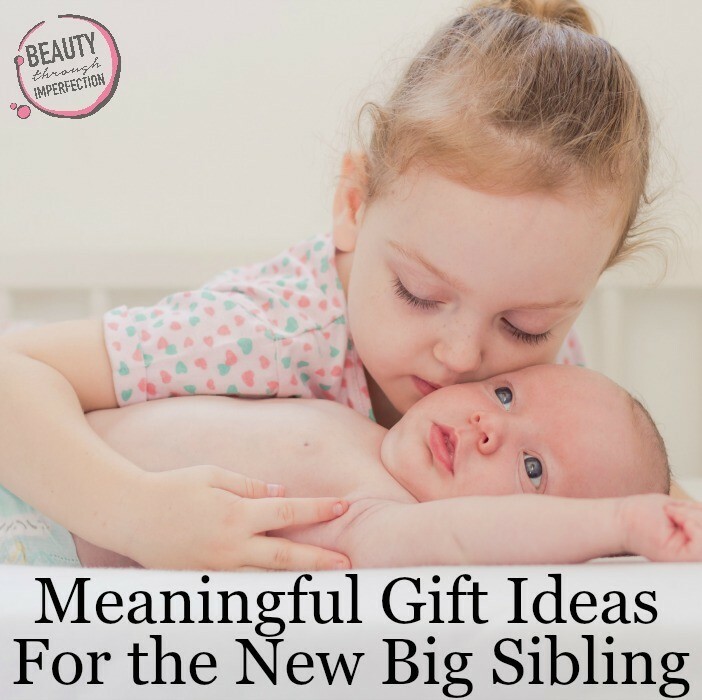 Hey Buddy!, I found this information for you: "5 Gift Ideas for the New Big Brother or New Big Sister". Here is the website link: https://www.beautythroughimperfection.com/gift-ideas-new-big-brother/. Thank you.